Mirza Asadullah Beg Khan with his pen name Ghalib is regarded the best sad Urdu poet. He echoes the heart beats of lovers with his unshakable creative imagination. Ghalib is often blamed for being a pensioner of British Government though his poetic compilations never depicted any political influence. Infact he remains deeply involved in his artistic creation. He does not waste his energies in other affairs. However, his poetry is also enriched with all other issues of social and personal level. Mirza Asadullah Khan Ghalib is cherished in all the Urdu speaking countries including India and Pakistan. Generally, poets are favored and disfavored according to the religion, ethnicity or creed dominant in the land. But in case of Mirza Ghalib, it is not so; he is respected equally all around the world. 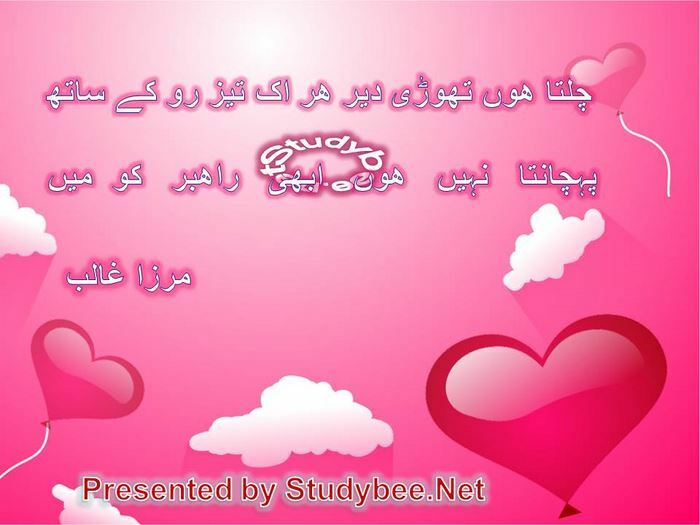 Enjoy reading ‘Mirza Ghalib Sad Poetry’ and comment if you like our work. Your suggestions are always welcome.